From the Saturday, February 20, 2016 Daily Sentinel: Oops! Anybody seen my lost handgun? 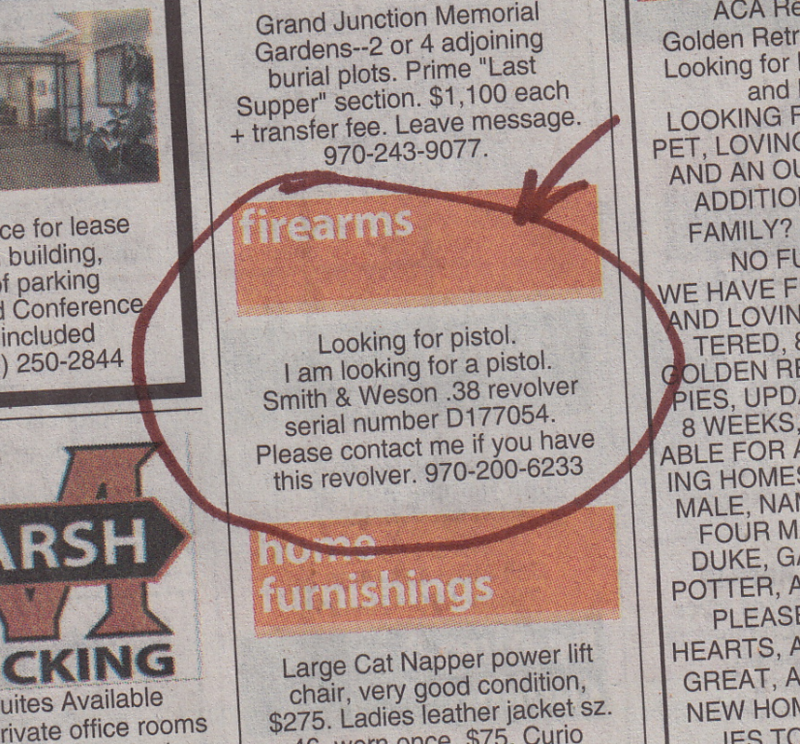 Incredibly, Colorado has no law requiring firearm owners to report the loss or theft of a firearm. One study (pdf) found that states without mandatory lost or stolen gun reporting laws export two and a half times more crime guns across state lines than jurisdictions with such laws. Eight-five percent of lost or stolen guns are never recovered, and police say stolen and illegal guns are at the root of violence across the country. Anne, just what would a new law have to do with stopping this? Who is going to arrest the law breakers? This is not an isolated case, many cops have an unregistered gun they can conveniently use when they need to and no law is going to make any difference.You know sometimes they just need the proof that “he was reaching for a gun”. Responsible gun owners do report lost and stolen guns, they don’t NEED a law to make them do it. They do it because it is the right thing to do and they do not want their weapon used illegally. By the way the ones who steal them, transport them across state lines, sell them illegally, and commit crimes with them are the ones who need to prosecuted and have their rights taken away, not the law abiding gun owner. But we know what the real goal here is now don’t we? Just one little step at a time. If the water in the pot is turned up slowly the frog will never notice it has gotten hot until it is too late. What harm has been done to responsible gun owners and sportsmen in the name of things that never happened? Your assumption is wrong.